Every year in Illinois, travelers are injured and killed in truck accidents, especially on highways near Chicago. In 2015 alone, over 1,000 Illinois truck accidents occurred, injuring over 2,300 people. Many of these victims were left to suffer serious consequences—painful injuries, emotional trauma, and financial stress. But victims of truck accidents don’t have to bear that burden by themselves. They have rights that can be protected. Illinois law allows accident victims to seek justice and compensation by pursuing a legal claim against those responsible. The experienced truck accident lawyers at Shannon Law Group, PC represent those who have been hurt by the negligence of others. Attorneys Joe Shannon, Pat Cummings, and Jon Svitak are available from the moment your accident occurs until the final verdict is read, taking care of all the technical details of your case so you and your family can concentrate on what matters most.We also ensure that our clients' medical needs are met, so they can move forward toward a secure future. If you or someone you love has suffered injuries from a truck accident, call our Chicago area office today at 312-578-9501. You can also take a moment to fill out our online contact form. You’ll receive a prompt response from one of our experienced team members who can answer your questions. Large vehicles can cause more damage to passenger vehicles. ​Typically, commercial trucks are much larger and heavier than the other vehicles on the road, and the path of destruction carved by a large truck can be significant. Some car safety features cannot protect occupants or absorb the impact of such a large vehicle, exposing those who share the road to serious dangers. Occupants in passenger vehicles sustain more serious injuries compared to truck drivers. On average, research tells us that occupants of smaller vehicles are injured and killed more often in large truck crashes. After serious injuries from these crashes, victims often face long and painful recoveries. They can be forced to miss a good deal of work or be unable to work again. Additionally, the physical and emotional pain that can accompany these injuries may require rigorous and ongoing medical treatment. Thus, the stakes in these cases are high for victims and their families. Professional drivers are involved. ​Commercial trucks, such as semi-truck trailers, are operated by professional drivers. They are one part of a larger system, which can include trucking, insurance, and logistics companies. As a whole, these companies want to protect their bottom line at all costs. Often, this means that truck accident cases can become very technical with many components, like federal regulations, insurance guidelines, mechanical systems, and more. 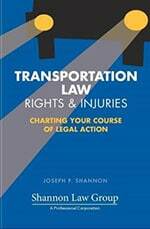 To learn more, download a free copy of our book, Transportation Law Rights & Injuries: Charting Your Legal Course of Action. If you’ve been in car crash, get our transportation law and car accident legal book for free today. Joe tips and tricks on how to have a successful case. If you or someone you love has suffered injuries in a truck accident, the stakes are high. Your health and financial future can be on the line, so your family will need attorneys who possess the knowledge and tenacity to get the job done. At Shannon Law Group, PC we pride ourselves on our relentless pursuit of justice and compensation for our clients. Our commitment is demonstrated in our results, which includes the highest recorded truck accident verdict handed down in Will County. While other lawyers may take the easy way out and accept a settlement right away, our attorneys will fight to get you the results you deserve. When you retain the services of an attorney, you expect that they will offer knowledge and experience for the best possible outcome, and we take that responsibility seriously. Joe Shannon, Pat Cummings, and Jon Svitak can help ease the burden on your family after a truck accident. Our team will work tenaciously on your behalf, so you can use your energy to get well and rebuild your life. Call our office today at 312-578-9501 to schedule a free consultation. You can also take a moment to fill our online contact form, and one of our team members will be in touch with you soon. I have worked with the Shannon Law Group for years. The firm is based on integrity and being available. They will give you honest and expert feedback and always take calls or get back to you right away. They are super friendly to work with and do a great job. I've known Joe Shannon personally and professionally for 20 years and have referred friends and family members to him. He is intelligent, strategic, personable and a person of great integrity. I highly recommend Joe Shannon and his team. I was involved in a head on collision with a wrong way driver. My car was totaled and my life was saved by safety restraints. Much to my surprise, my insurance company failed to properly represent me and I engaged Joe Shannon's services to recover my losses. Joe resolved the matter in a quick and cost effective manner. I have since referred a number of other individuals to the practice and they have all had very positive experiences and outcomes with Joe's firm. Joe is also very active in supporting the local community. I would recommend him without hesitation. I had an excellent experience with the Shannon Law Group. Joe Shannon is a man of high integrity and compassion. When I contacted Joe, he quickly got back to me. He provided great legal advice and support during the case. I highly recommend the Shannon Law Group! Joe Shannon is an incredible lawyer backed by an amazing team. I referred a family to him and have been amazed at how his team has helped them when no other lawyers would. He isn't afraid of the tough cases - he knows how to win them. He works more than hard for his clients. He and his team build innovative strategies and execute with integrity and courage. Their approach brings results for their clients that most firms could never get. They care. They will fight for you. They are the people you want in your corner during what may be one of the most difficult challenges you face.